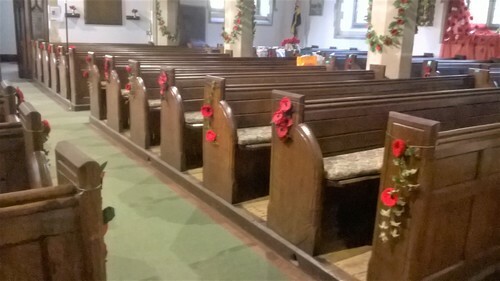 About six weeks ago a notice went out around the church asking ladies, (sorry gents) to knit or crochet poppies. 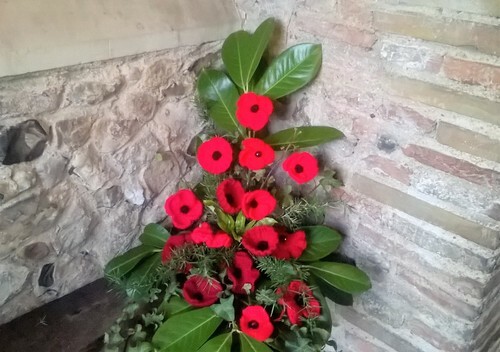 Sue Cole explained that she had left some paper patterns at the back of church for anyone who wanted one and that the poppies could be brought back so that the church, mainly the archway over the door could be decorated for Remembrance Sunday. Out came the needles, crochet hooks and a few other types of needles as many of the ladies must have abandoned their house-work to tackle the poppy appeal. 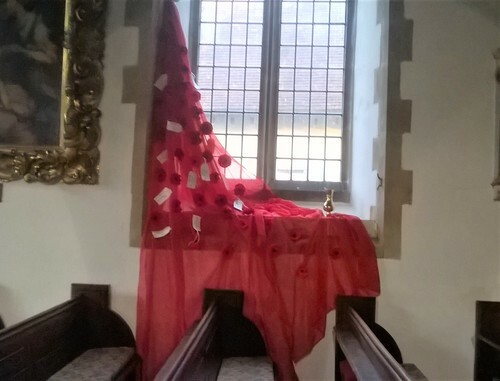 All over the country people have been donating thousands, indeed it must have been millions of carefully hand-crafted poppies to help decorate their churches to honour those men and women who gave their lives in the Two World Wars so that all those of us who were left could live in peace. 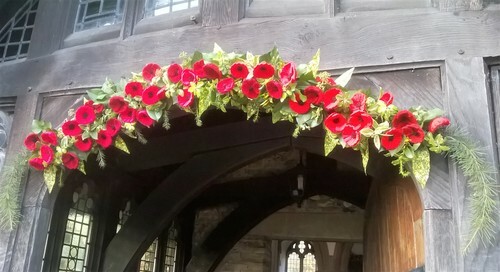 As the weeks rolled by the poppies built up until it was decided that perhaps besides the door archway, we could use some of the poppies to decorate the church, and so it was when a small team from the Ladies Group meet on the Thursday afternoon prior to Remembrance Sunday and the decorating began. I think we were all totally shocked at how many poppies the ladies had produced, so with the help of a mug of tea or two St Mary’s Church was filled from top to bottom with poppies. Although Sue had worked for some days prior, setting up and organising the display of poppies most of the work was completed by 4pm with just a few more bits to do, so we all went home leaving Margaret Pinkerton working on the beautiful flower arrangements as usual, and did she use any hand-crafted poppies? Well of course she did, and what a beautiful job she made of them too. 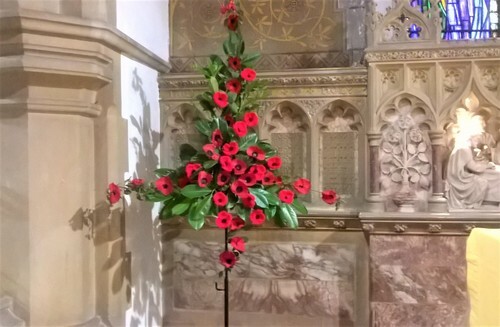 I am sure we would all like to thank all the ladies who produced so many beautiful poppies and to Sue for all her work and organisation skills to help make our church look so beautiful and so fitting to remember those who gave their life for others.